Transform your stationary conical into a mobile one with these easy to assemble locking wheels! Each wheel secures to either the conical frame, or our optional Leg Extensions, with standard 1.5 inch tri-clamps. All three casters feature foot-operated locks to keep the fementer stable. Our wheels are ideal for use on smooth, flat surfaces. Set comes with 3 Casters, 3 Tri-Clamps, and 3 Gaskets. Quality & no others fit. Must be able to move the conical around during the brewing and fermenting process. Very sturdy wheels tha t roll easily over rough floors. These are well worth it for moving a full fermenter around in a garage. I bought the wheels and the long extension legs. It is nice to be able to roll the fermenter around, even to agitate yeast during fermentation. The system is not very stable as it is top heavy. if the wheels hit a power cord, piece of tube, crack in floor, etc it might tip over. I don't understand why MoreBeer makes these using Tri-clamps. Is there a more cost effective way to make them? No question that these make it easy to move your fermenter around. I use it on my 7.5 gal fermenter. You do need to be careful when rolling as your fermenter will topple easily, especially when full. My suggestion is to rotate the wheels outward before you lock them in place, it will help make your fermenter more stable. I use these to move my 14-gal heated/cooled conical. 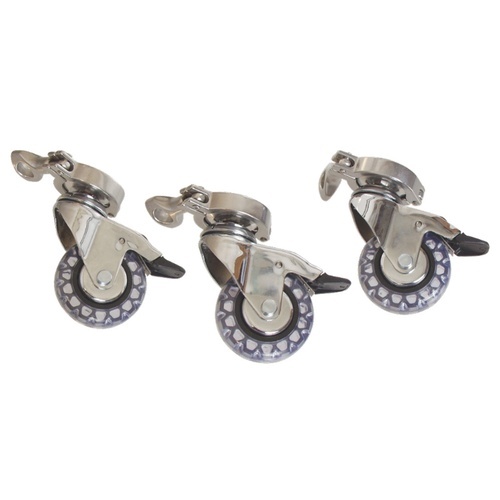 Good quality casters which roll smoothly and have a lock on each one. I use them with the 6" leg extensions which leaves plenty of room underneath to use the Ultimate Yeast Harvester. Be careful though as they make the conical very top heavy, especially when empty and if using any leg extensions. When moving mine I have to hold firmly with two hands and pull it (pushing it would cause it to topple over). An improvement would be to design them similar to the Blichmann casters so that they widen the base by a couple inches. No regrets. I'd buy them again. Not much you can say about a set of casters. If you need to move your conical from time to time, you need these. I'm using these on a 14gal heated/cooled conical. They work well, seem nice and sturdy and I think the price isn't too bad considering the tri-clamps and gaskets that are included with these are worth about $25 alone. For those who are curious, these add about 4.25 inches to the height of the fermenter.